When it comes to health, it used to be about the type of foods you are eating, and how you can change your diet to include more nutrient-rich foods and less processed ones. Now health has been proven to be more so about how the food is prepared. Simply paying more attention to how you are preparing your food can make for a much healthier diet and lifestyle. The air fryer, which can be found in review on https://heissluft-fritteuse.com/, is one of the great innovations in diet and health that allows individuals wanting to improve their diet to enjoy fried foods without consuming the unhealthy oils necessary to fry the food. It utilizes a fan system to significantly reduce or completely remove the use of oil. This is especially good news for those prone to having high cholesterol or heart disease as it cuts down on trans fats and saturated fats. The following are the 4 foods that you can cook healthily using an air fryer. Rather than having to take a hit to your diet when enjoying a nice full breakfast, the air fryer is able to fry potatoes with little to no grease. Combine these potatoes with peppers and onions for a delicious plate to bring to the breakfast table, guilt free! Try it with regular potatoes, or sweet potatoes for an extra bit of flavor. Without the unhealthy grease component to frying, you can enjoy as many as you want without consuming unhealthy trans fats and saturated fats! French toast is a delicious, sugary concoction that so many enjoy. When fried though, making French toast can really rack up the trans fats and saturated fats. When utilizing an air fryer on the other hand, making this tasty treat is much less unhealthy! It is also incredibly easy to cook with the air fryer, and requires almost no work or skill. You just need to preheat the air fryer. After preheating, make the French toast recipe. We recommend the eggs be mixed with some salt, a bit of cinnamon, as well as some ground cloves and nutmeg. After creating this, coat buttered bread strips in the egg mix, and place them in the air fryer. Once the strips of bread are golden brown, they are complete! It is as easy as that to cook a delicious healthy meal in the air fryer! 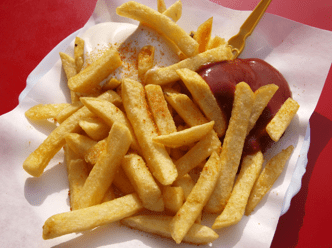 For many of us, one of life’s guilty pleasures is a delicious plate of French fries. These seem off limits, though, when going on a diet. The oils needed to fry a plate of golden brown French fries can be damaging to the body and eventually take a toll on the heart among other necessary organs. With the air fryer though, these oils are essentially eliminated from the cooking process, and the recipe is totally simple. This is great for anyone with little time to spare who still wants to eat healthy and enjoy delicious recipes. After washing and optionally peeling the potatoes, slice them to the size of French fries. After that, season them. Seasoning is totally up to whoever is making the fries, but a great tried and true seasoning tip is to use a blended mix of garlic, salt, and pepper. After seasoning the French fries, cook them in the air fryer, tossing them a few times throughout the cooking process. After that, the fries should be done and ready to enjoy with the family, or with friends on a movie night. These fries are easy as well as healthy and delicious. A delectable snack many enjoy is the Jalapeño popper. This snack is traditionally prepared in a way that is incredibly unhealthy. Making them at home in the air fryer, however, is easy and healthy and great for those looking to enjoy a taste of spicy cuisine without ruining their diet. The recipe is simple. It begins with creating a mix of breadcrumbs and cream cheese with a bit of parsley. This mixture can be stuffed into halved jalapeño peppers. After stuffing the peppers, the only thing left is to cook the peppers in the air fryer and then enjoy!